DL: Dave Eilers (P-Salt Lake City Saints), sprained neck, three days. Larry Maxie (P-Tucson Stingers), dislocated shoulder, nineteen days. Having lost their last three series, the Dusters rolled into Cincinnati determined to win. The big question mark was a new starter, just called up from AAA Bakersfield, named Pete Richert. A cautious Ben Naylor left Richert in for just three innings, during which the southpaw allowed one run on five hits while striking out three. From then on it was up to the bullpen to hold onto a 3-1 lead. Jim Umbricht retired the side in the Reds 4th, and in the Duster 5th Billy Williams doubled and scored when Don Blasingame threw the ball away trying to get Tom Tresh out at first. The 4-1 lead was trimmed in the Cincinnati 5th when the Reds hit four consecutive singles, scoring twice, but Nevada broke it wide open in the 7th against Johnny Klippstein; Hector Lopez tripled, Tom Tresh doubled, and the Dusters added three runs to their total. Johnny Blanchard's solo homer one frame later made it 8-3, and Bill Dailey, Bob Duliba and Claude Raymond held the Reds scoreless in the final three innings. It was a day for extra base hits -- Nevada's seventeen hits included four doubles (Lopez, Adair and two by Williams) and three triples (Tresh, Adair, Schaive). Adair was 4-for-5 on the day, Blanchard 2-for-3 with a pair of RBIs. Best of all, in Naylor's opinion, there were no errors charged to the Dusters. The Dusters had trouble with 21-year-old rookie starter Sammy Ellis, heralded as one of the most talented pitchers to come through the Cincinnati organization in years. Ellis put his talents to good use in Game 2, holding Nevada to four hits in seven innings. 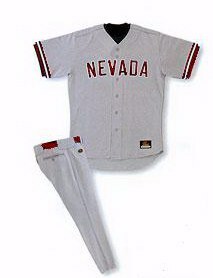 Nevada's Joe Horlen (4-2) allowed just six hits in his seven innings of work, and each hurler gave up a pair of homers. Clete Boyer hit his third of the year, Hector Lopez his sixth for the Dusters. Gene Freese and Frank Robinson accounted for the Cincy long balls. The game breaker was Robinson's RBI single in the 6th, followed by a Jerry Lynch single that drove in Robinson. At that point the Reds had a 3-2 lead, to which Robinson added in the 8th with his solo blast. The Dusters couldn't get a man to second base after the 3rd, so dominating were the Cincy pitchers.Ken Hubbs, starting at second base for Johnny Schaive, went 0-for-3, causing Ben Naylor to shake his head. He and Conn Hudson kept expecting the talented middle infielder to start hitting. Apparently, they would have to wait a little longer. The Dusters hoped to win the rubber game and avoid losing their fourth series in a row, but they knew it would be tough sledding against Cincy ace Jim O'Toole. Those hopes hinged on Dave McNally (5-0), who came through with another outstanding performance on the mound. McNally surrendered two runs on four hits through eight innings. The Duster bats did their part as well, with Tom Tresh clubbing a three-run homer to right in the 1st, and Billy Williams adding a two-run homer in the 8th that almost brushed the right-field foul pole at Crosley Field. Closer Claude Raymond served up a solo home run to Frank Robinson in the 9th but retired the next three Cincy batters to earn his sixth save, while McNally got his sixth win in seven starts. The kid, said the pundits, was for real and, at this stage of the season, was Nevada's most valuable player. By winning the series the Dusters found themselves catapulted past Cincinnati and Los Angeles (both 17-16) into third place in the NL behind Pittsburgh (26-10) and San Francisco (20-13). But the road ahead wasn't easy -- back to Chavez Ravine for three more with the Dodgers before traveling to Pittsburgh to face the Pirates. LAA--Bob Bobz (P), broken ankle, two months. BOS--Mike Andrews (2B), torn hamstring, four weeks. MIN--Jim Kaat (P), severe elbow tendonitis, three months. PIT--Joe Gibbon (P), strained knee, two weeks. 3 runs, 3 hits, 1 error, and 2 left on base. In the middle of the first, Nevada leads 3 to 0. At the end of the first, Cincinnati trails 3 to 0. In the middle of the second, Nevada leads 3 to 0. At the end of the second, Cincinnati trails 3 to 0. In the middle of the third, Nevada leads 3 to 0. At the end of the third, Cincinnati trails 3 to 0. In the middle of the fourth, Nevada leads 3 to 0. At the end of the fourth, Cincinnati trails 3 to 0. In the middle of the fifth, Nevada leads 3 to 0. At the end of the fifth, Cincinnati trails 3 to 0. In the middle of the sixth, Nevada leads 3 to 0. At the end of the sixth, Cincinnati trails 3 to 0. In the middle of the seventh, Nevada leads 3 to 0. At the end of the seventh, Cincinnati trails 3 to 2. In the middle of the eighth, Nevada leads 5 to 2. At the end of the eighth, Cincinnati trails 5 to 2. In the middle of the ninth, Nevada leads 5 to 2.